Even as "predicting" that the Congress will lead the United Progressive Alliance (UPA) to victory during the 2019 Lok Sabha elections, senior Congress leader known to be close to party president Rahul Gandhi, Sachin Pilot, has given clear indications that Rahul may give up his claim for Prime Ministership for the sake of opposition unity. "In the last 30 years, no one in the Gandhi family has occupied the position of a Prime Minister, Chief Minister or a Minister. I don’t think Rahulji is now looking to occupy the top position. He is building the party, he is taking on the challenge of the BJP, and we don’t know what the future holds”, he underlined. “The Congress will lead an opposition alliance but who will occupy what position, time will tell,” Pilot, who is in Melbourne, told in an interview to South Asia Times (SAT) editor Neeraj Nanda. Pilot, along with another senior party leader, Milind Deora, were attending a meet -and -greet event organized by the Indian Overseas Congress, Australia. 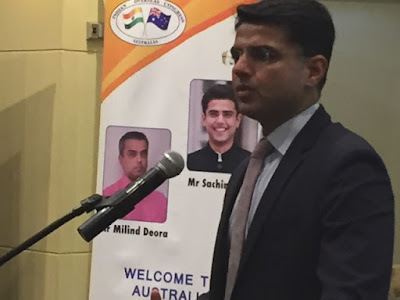 According to the SAT report, the two Congress leaders’ visit is being seen as a continuation of the earlier visit by well-known NRI technocrat Sam Pitroda, aimed at revitalizing the Congress amongst the large Indian diaspora in Australia. Pilot said, “The current Modi-led NDA regime is incompetent to rule and we have got a whole policy framework as an alternative; in 2019 there will be a UPA plus plus government." Commenting on the lynching incidents in India, Pilot said, “There are laws in the country including on cow slaughter. If anyone violates those laws the due process of law should take its own course. But it cannot be that on mere suspicion you attack and kill people in broad daylight. Those convicted in lynching are being garlanded by political leaders. This our country cannot afford to have." When asked why was the Congress is not launching a nationwide agitation on the lynching issue, Pilot said, “We have taken it to the task. It is not just a Congress issue, but a human issue. As a political party, we are opposed to any sort of violence. It’s a law and order issue, the state governments are supposed to look after it." "The Congress and its President Rahul Gandhi have taken up the issue in the Parliament. We have protested against the violent nature of our politics and the people of India are seeing this happening and will give a befitting reply to it in the 2019 elections.There were anti-social elements before also but these elements now have the courage to do these acts. The incumbent government will have to give a big price for it", he added. The view is strong in the Congress that a united Congress-led opposition before the 2019 Lok Sabha elections does not look a distant possibility. QIf the Congress is ready to give up the claim on party president Rahul as the prime ministerial nominee, more opposition parties may join hands to pose a bigger challenge to the BJP-led NDA. Pilot's statement acquires significance against the backdrop of the strong view among circles around Rahul that most of the opposition parties till now were reluctant to align with the Congress with Rahul Gandhi as the prime ministerial nominee. As and when Gandhi's candidacy for the PM's post was raked up, most of the Opposition parties kept away from joining chorus with the Congress. While in May, campaigning for the Karnataka Assembly elections, Gandhi claimed that he would be the prime minister in 2019 if his party gets maximum seats, according to this view,that declaration met with a bleak approval not just from the non-NDA and non-UPA parties but also from the Congress itself. Not without significance, three crucial opposition parties which would matter in 2019, such as Akhilesh Yadav-led Samajwadi Party (SP), Mayawati-headed Bahujan Samaj Party (BSP) and Lalu Prasads Rashtriya Janata Dal (RJD), prevaricated on extending support to the Congress with Rahul as the PM candidate. After all, the three parties hold significance for the Congress because it has aligned with them in the last Uttar Pradesh and Bihar Assembly elections in 2017 and 2015 respectively. Moreover, the two states together account for a whopping 120 of the 543 Lok Sabha seats (22 per cent). Meanwhile, among those leaders who are said to be keen on being projected as PM candidate include Lalu Prasad Yadav's son Tejashwi Yadav, BSP's Mayawati, and Samajwadi Party leader Akhilesh Yadav. The issue of Gandhi as PM again became the talking point in political circles when the Congress' highest decision-making body, Congress Working Committee (CWC), met on July 22 and ratified the decision. While several Congress leaders approved it, barring Congress alliance partner in Karnataka, the Janata Dal (Secular), no other party came forward to support it. These included West Bengal CM Mamata Banerjee, Andhra Pradesh CM N Chandra Babu Naidu, NCP chief Sharad Pawar. This led the Congress to suggest on July 24 that Congress that it would support any candidate who would not be backed by the Sangh parivar or the ruling BJP.